A group of Native Hawaiian activists chained shut the doors of the John A. Burns school of medicine Thursday (May 18th) in an attempt to facilitate a dialogue with the Board of Regents from the University of Hawai'i. Previous attempts to articulate their demands have been largely ignored by the University Administration. 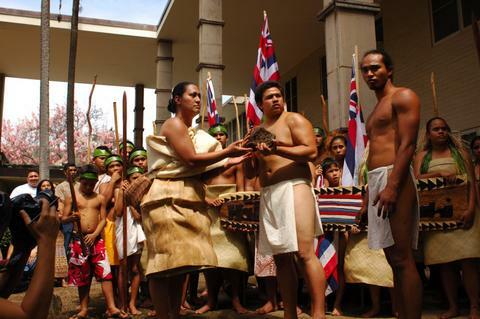 The two demands of the group and of the Hawaiian community at large are that the University drop it's patents of the Kalo plant and immediately halt the genetic modifications that have been going on for years without the approval or knowledge of the community. Last week the group conducted a candle light rally in front of the house of University President David McClain in hopes that he could be confronted and would be held accountable for the administrations position on the patents and also for approving the University Affiliated Research Center, which would allow the United States Navy to conduct secret military research on campus. Security guards were posted at temporary gates in front of the two entrances to the house, preventing the group from delivering a list of their demands. The president did not return to his home that night and activists have persisted and are continuing to take the actions that they feel are necessary to have their demands met. The group has made it clear that they will not go away and will escalate their actions every time they are forced to confront the University Administration. The City of Honolulu and Mayor Mufi Hanneman have yet again displaced hundreds of city park residents in their latest attempt to improve the image of the city and avoid confrontation over the lack of public programs and resources available to Hawai'i's poor communities. Although many of the Ala Moana park residents feared arrest and were not able to attend, a large group of residents and supporters marched from the park to Honolulu Hale (city hall) where they set up camp and demanded answers and a response from the Mayor for these actions against them. A large group of police arrived after about an hour and threatened arrest to those that did not leave the public hall. There were 4 arrests made, 1 of which was done with force, when protesters refused to leave. A group estimated at 600 people from Native Hawaiian groups, Hawaiian charter schools, and University students rallied at the University of Hawai'i's Bachman Hall on March 2nd to protest the University's plan to patent two of the more popular strands of the Kalo (Taro) plant. For native Hawaiian's the plant is sacred and and an important reminder of thousands of years of sustainable agriculture. The proposal has outraged people from a wide spectrum as it would force farmers to purchase the cuttings needed to grow Kalo and also require them to pay royalties on the produce to the State of Hawai'i. On March 17, the Wai`anae Neighborhood Board met to discuss the latest information on chemical weapons dumping that occurred off their coast for thirty years beginning in the 1940’s and were recently discovered. Community and the board heard from Deputy Assistant Secretary of the Army for the Environment, Tad Davis, who provided a general summary of their findings in Hawai‘i waters. The military is working solely off of records from previous decades, which Davis claimed “give us the best information they have right now.” Further review, however, may be conducted. A group of approximately 75 concerned citizens asked questions, shared their knowledge and relayed a message to the Army rep, “ We don’t trust you”. This statement is not surprising when considering the U.S. military’s wake of destruction, including Makua Valley, Kaho`olawe and Pearl Harbor to name a few. Davis said that the information regarding the dumping was classified during the 40’s and became unclassified decades later. Terri Keko`olani responded with concerns that the secrecy and classified status only exacerbate the issue. She also noted the current struggle with the University of Hawaii and the proposed UARC ( University Affiliated Research Center), which would conduct classified research. Many residents cited health problems resulting from chemical exposure. Dr. Fred Dodge of the Wai`anae Comprehensive Health Center stated that the coast is the leader among all the Hawaiian islands when it comes to three types of cancer. Another resident cited the unusually high rates of autism occurring on the coast. While the army’s booklets said nothing of the chemicals’ effect on people, KAHEA: The Hawaiian-Environmental Alliance provided an informational sheet citing immediate harm such as stomach pain and shortness of breath, as well as long term physical harms, including lung cancer, blindness, and coma. Instead the “Recognize, Retreat, Report” sloganed booklet gave ways to identify abandoned weapons and how to react. 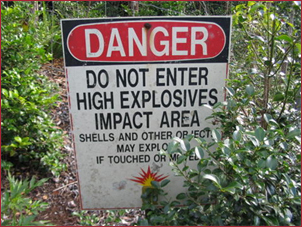 It also provided an anecdotal warning telling of two cowboys who were “unfortunately” killed when they came into contact with UXO (Unexploded Ordinance). KAHEA’s sheet also requested that a telephone hotline be established for the community to be kept up-to-date on the developments, as well as to leave information of findings and sightings. It was also suggested that one or two members of the community be on the committee “to provide truth.” “Feelings need to be taken into account” said one resident. If the army is indeed committed to a thorough review and remedy of this tragic situation as they claim, then they will need to work hard to restore Wai`anae and all of Hawai`i’s trust. University of Hawai'i Presidency Is Challenged! Students of the Save UH/Stop UARC Coalition perform a piece of guerilla theater in response to the discontinuation of a search for a permanent president of the University of Hawai'i. University of Hawaii students performed a coronation on Tuesday for Prince Yes, a contender to the throne of the university. The UH Board of Regents have approved a sole-source appointment of Interim President David McClain to the position of President, without a national search. Mr. McClain recently recommended the adoption of a"University Affiliated Research Center" at the University of Hawaii, which institutes a research arm of the US Navy at the top levels of the university. UH students, faculty, and community members occupied the school's administration building in April 2005 to protest the establishment of this military research center. In Fall 2005, the UH Manoa Faculty Senate voted to oppose it, followed by the administrator of the Manoa Campus and two other faculty senates statewide. Prince Yes is running against David McClain for the top position in the UH system. Prince Yes promises to say 'yes' to military research, 'yes' to business interests and corporate privatization, and 'yes' to saying 'no' to faculty, student, and Native Hawaiian concerns. Last semester, Manoa Faculty Senate and the Manoa Chancellor joined the student government, the Kuali‘i Council, the Faculty Union, and concerned communities in opposing to the UARC proposed for UH. According to the process Interim President McClain outlined during the Summer 2005, this should have ended the UARC debate. However, Interim President McClain is still pushing for its approval, and is calling for another meeting before the Board of Regents. Hold the BOR accountable by being present and urging that the UARC proposal be terminated, finally. Mahalo! January 20, 2006 1:00 p.m.
Support the Community's Decision: Stop UARC, and cancel the "informational meeting." The community has spoken, and it said "NO UARC at UH." This "informational meeting" is too little, too late and serves to undermine the diverse voices which have articulated serious concerns over the last year. Demand Fairness: If the BOR insists on holding this "informational meeting," then it should hold a fair meeting. The format should be changed to give the public the freedom to freely express their concerns about this proposal. Individual speakers not be limited to the allotted 3 minutes, while the Administration is given an unlimited and uninterrupted opportunity to make its sales pitch. Demand Transparency: The BOR must share all written testimony submitted on the UARC issue to the public. This allows the public to see what information the BOR is receiving, from whom, and what outcome it creates. UH is a public institution, funded with public money, and ultimately under public oversight. Full disclosure of all information is the minimum owed by this institution to the public that runs it. The School of Hawaiian Studies hosted a conference on December 3rd to share ideas for new transitional and community re-entry programs for the prisoners of Hawai'i. The current re-entry programs have proven to be extremely ineffective, with 81% of state inmates returning to prison for violations of their parole. The majority of these violations are victimless, minor drug offenses. Speakers included former inmates, social workers, university scholars, and even two representatives of the State of Hawai'i's Department of Public Safety. Individual needs are usually overlooked when it comes to prisoners finding something positive to return to after incarceration. The former inmate panelists expressed their frustrations at returning to families dealing with drug abuse and generational incarceration. The total state funding that is required to run prisons in Hawai'i is five times the amount provided for public education. Inmates are often released with no ability to read or skills to survive in a society where substance abuse relapse and crime is the only option in sight. Kaleihau Kamauu, a former inmate of the Halawa High Security prison, suggested that programs for prisoners of Hawai'i should include Hawaiian culture and an emphasis of responsibility to their community and homeland. Rehabilitation programs that were developed for inmates on the mainland have proven to have little effect in the rehabilitation of the Native Hawaiians that make up 62% of the prison population in Hawai'i.